A while back, we introduced you to our four-legged friend, Humphrey the camel -- a new type of mount that has made its first introduction to the Mount & Blade series in Bannerlord. We figured that it was only fair that one of the staples of our franchise got in on the action and be represented in a variety of its majestic forms. In other words, we realised it was time to stop horsing around and put a little more effort into one of Mount & Blade’s mane attractions. Previously, the only addition we had made on this front was the horse mark system that we discussed in a previous blog. The horse mark system is just one of the many small touches we have added to the game with immersion in mind. But, by adding unique horse breeds, we realised we could take this one step further by tying these new additions to existing gameplay mechanics. In total, we have added six new horse breeds to the game; each of them inspired by real-world breeds from Europe, Africa and Asia. Each of the new breeds is attached to a different culture in the game. Each particular breed can be further trained as a war horse, which will be much stronger and tougher but will also be much more expensive. So, overall there will be twelve types of horse, in addition to pack horses and mules. Horse breeds have different stats that give them unique advantages. Players will no doubt pick those that suit their play styles. Aserai – Desert Horse: Legends abound on the feats of the famed Aserai horse. And for good reason. These animals bring together the perfect combination of swiftness, grace and endurance. Aserai horses make excellent war mounts. Their riders, however, have to take good care of their horses, since they are typically rather more expensive than other types. Battania – Highland Pony: Battanian mountains are among the harshest environments in Calradia and Battanian breed tough horses that can withstand conditions that few horses can. Empire – Saddle Horse: The empire has a long equine tradition and through time, they have strengthened their local breeds by crossing them with the best specimens they encountered throughout the continent. Imperial horses are big and strong enough to carry armoured soldiers, and they are both brave and dependable in battle. Khuzait – Steppe Horse: They say that the Khuzaits are born on the saddle, and without a doubt, their horses live up to their reputation. These animals are not particularly big, but they possess extraordinary endurance. Khuzait horses have low charge damage due to their stocky build. They are not very fast but they can turn and manoeuvre with surprising agility. 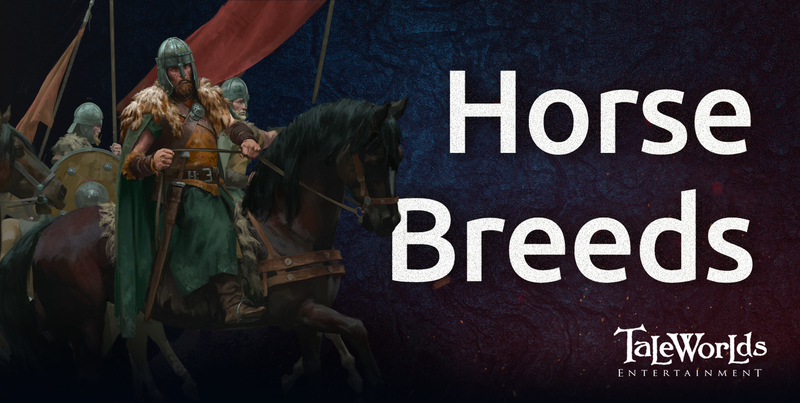 They are also bred in great numbers in the steppe herds which allow Khuzaits to employ large cavalry and horse archer armies. Sturgia – Sturgian Horse: Sturgian warriors prefer to fight on foot, and horses are bred for endurance and surviving the harsh winters rather than strength on the battlefield. Nevertheless, these animals make good mounts for scouts and light cavalry. Vlandia – Vlandian Horse: A century ago, Vlandians were a relatively unknown tribe who fought exclusively as footmen. But there emerged a new class of mounted warriors among them that helped them dominate the fertile western parts of the continent. Their horses are strong, dependable creatures that, while not particularly agile, possess the toughness and courage to ride into the thick of the battle. And with that, it is time to hit the hay! Posting some numbers would be nice. Most all of them sound,, "strong," to me.. The blessing of the working moral "it is done, when it is done". 7years past, no ending in sight, and horse models which look like♥♥♥♥♥♥ The jokes about the graphics getting bad until release are realer than ever. BLOGLORD II and calling their fans fanboys for defending the delay. Ban me again, i do not care, i stand by my words. I was a big supporter of your games, will never buy any of your games, i do not care how good they are. You cannot handle negative criticism and then then your fanboys cries, so you ban people.